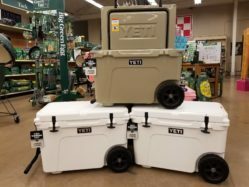 Pick up the new YETI Tundra Haul cooler- the YETI with wheels at Ark Country Store in Waxahachie! This cooler is as effective at cooling as your favorite YETI cooler. With the addition of two wheels and a long handle, theYETI Tundra Haul cooler makes it easier to transport. Say goodbye to lugging your cooler around! The YETI Tundra Haul is a game-changer for tailgates, stock shows, fishing trips, or your favorite fall activity. The Tundra Haul features a stainless steel arm that is curved and tracks either left or right for better towing comfort. Now your YETI Tundra cooler can go the extra mile with ease. This is the toughest cooler on two wheels. Come see this new edition to the Yeti Tundra family at Ark Country Store. This entry was posted on Sunday, September 23rd, 2018 at 6:42 pm	and is filed under News & Updates. You can follow any responses to this entry through the RSS 2.0 feed. Both comments and pings are currently closed.